The origins of the modern day 12-string guitar are mysterious indeed. Appearing in the United States around the turn of the 19th century, 12-string guitars were initially considered novelty instruments and were built and sold cheaply. Because of their cheap price and extra volume, 12-string guitars were first used by street performers who wanted to work alone but had trouble being heard above the roar of the crowd. However, as time went on the 12-string guitar grew into a popular folk instrument still widely used by both budding amateurs and rock superstars of the present day. No one knows for sure where the modern day 12-string guitar came from but the two most likely scenarios are either Italian or Mexican immigrants. Italian music has a long history of double-stringed instruments (such as the lute and mandolin) and it is theorized that Italian luthiers working in American guitar factories experimented with doubling the strings of a standard 6-string guitar. Many of the companies that make 12-string guitars to this day have strong Italian connections. Another possible theory is Mexico, where there is a long history of adding extra strings to the standard 6-string guitar as in the guitarra séptima and the bajo sexto. Whatever the case may be, 12-string guitars most certainly arrived in the U.S. from elsewhere with the first double-stringed instrument to be designed in the U.S. being the Gibson archtop mandolin. Because they were originally considered novelty instruments and cheaply made, 12-string guitars were usually used by the poorer folk of Appalachia and the American southwest. As a result 12-string guitars worked their way into the blues, folk and Tejano music styles typical of these demographics. 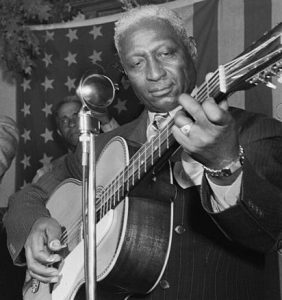 In the 1930s and 40s guitarists like Leadbelly, Blind Willie McTell and Fred Gerlach would popularize the instrument in blues and folk music circles while Lydia Mendoza and other Mexican-Americans would popularize it in the American southwest. It wasn’t until the 1960s when guitarists like Pete Seeger, George Harrison and James/Roger McGuinn would popularize the 12-string guitar for pop and rock music. Following the 60s revival, the 12-string guitar was used extensively by the folk-rock bands of the 1970s like America, Kansas, and The Eagles. Although it was mostly played as an accompaniment because of the difficulty in bending strings and playing solos, the 12-string guitar would also be used for more innovative solo work later on. Eventually, even rock artists such as Jimmy Page, Tom Petty, Jimi Hendrix and Stevie Ray Vaughan would all incorporate the 12-string guitar into their work. 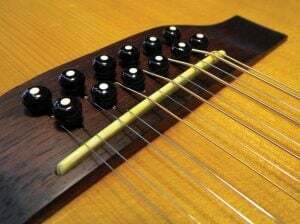 12-string guitars are known for their longer headstocks in order to accommodate for the extra strings as well as their shorter fretting scales due to the added tension on the neck and body. Initially, 12-string guitars had a habit of warping due to the added tension but today’s luthiers have perfected their craft so that this is no longer a problem. The bridge of a 12 string guitar. Image courtesy of Premier Guitar. On a 12-string guitar the bottom four strings (E, A, D and G) are tuned normally. The doubled-string underneath each of these four strings is tuned one octave higher. The top two strings (B and E) and their counterparts are tuned in unison. Except for the Rickenbacker 360/12, which reverses this order, this is how the large majority of 12-string guitars are tuned. The resulting sound adds a “shimmering” quality to the tone of the guitar which provides extra volume and a chorus like effect to the instrument. Pete Seeger once famously described the sound of the 12-string guitar as “the clanging of bells” and indeed it has the same reverberant quality that bells produce. Many guitarists have been known to experiment with this tuning, sometimes using a unison string for the doubled G string instead of an octave string, or tuning the doubled string for the low E two octaves higher rather one. Whatever you choose to do, it all depends on the sound you’re going for. Interestingly enough, many Nashville music producers in the 1990s were fond of mimicking the sound of a 12-string guitar by using two guitars in a process now known as Nashville Tuning. To accomplish this, they tuned the bottom four strings of one guitar an octave higher than a standard 6-string and played the two guitars in unison to create that shimmering 12-string guitar texture. Songs like “Dust in the Wind” by Kansas and “Wild Horses” by The Rolling Stones are both notable for using this technique. Jimmy Page playing his Gibson double-neck. Since the arrival of the original 12-string acoustic guitar there have been many variants both acoustic and electric. Some experiment with different tunings or strings inversions such as the Rickenbacker 360/12. 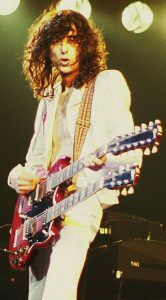 Jimmy Page popularized the double-neck 12-string guitar which features a 6-string on the bottom half for leads and a 12-string up top for chords (This is what gives Stairway to Heaven its signature sound). Others, such as the Fender XII use staggered pickups to give off a deeper sound. Still others, such as the Brazilian CraViola experiment with different body shapes to give off a brighter sound. Whatever the case, the 12-string guitar has proven to be a very customizable instrument. Because of the difficulty in bending or soloing quickly, 12-string guitars are usually played as rhythm instruments accompanying other 6-string guitars or lead vocalists. Rarely are they used as main solo instruments except in the case of guitar virtuosos such as Leo Kottke who has made extensive use of the instrument in a variety of unique ways. 12-strings are usually played with a flatpick, their double-stringed setting making it difficult to play with most fingerpicking methods, but fingerpicking is still possible. 12-string electric guitars with their lighter gauges have made it easier to play 12-strings but their reverberant, shimmering tone lends them to still be preferred as rhythm instruments. As a bonus for reading this far, you have to check out these videos of Stevie Ray Vaughan ripping on a 12 string from his MTV Unplugged set, and Jimi Hendrix playing a 12 string in a white room for no real reason at all. You’re welcome. Need some strings for your 12 string? Whether you favor an electric or acoustic 12 string, we’ve got you covered. Check out all our 12 string electric sets, our Bright Brass™ 12 string sets, or our Natural Bronze™ 12 string sets to get your 12 string sounding alive and jangly on the double. The Bajo Sexto,or low six is tuned in fourths an octave below modern,and a Vahuela Lute is tuned A D G B E A only the 3rd string a half below standard baritone low A and B.Until 1970,most 12 strings were sold suggesting ' detuning'3 or 4 whole steps,all though today Fender and other international makers produce instruments that can be tuned to modern high E or standard tuning.